Jovian had given away a big chunk of the empire in his humiliating deal with the Persians. He betrayed loyal subjects of key frontier towns in the process. His purge of political enemies deprived the state of the services of some able administrators and soldiers. But his army was saved. He was in personal charge of the most powerful single unit in the empire. They were exhausted after a 1500 mile round trip in hostile territory across tough terrain, but even so they were Jovian’s key to the throne. By the rules of the game he was playing, Jovian was winning. He kept them under arms to deal with any problems, but in fact things fell into place pretty well. His appointees in the western half of the empire were recognised without difficulty, including his father in law in Gaul. Legitimacy was Jovian’s biggest problem and once it was clear that that had been sorted he could settle down to setting up his new dynasty. 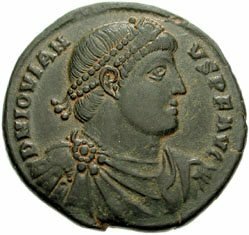 He crowned his infant son as co-emperor and so with Jovian in his mid forties and a clear succession plan in place the empire looked set for a new period of stability. Jovian had been brought up as a Christian and one of his first actions was to announce that the Church was restored to its previously privileged position. This no doubt fitted in with his personal convictions, but also made perfect political sense. A powerful disgruntled minority were transformed into a strong group of supporters. Julian had not made much progress with his plan of uniting the pagans, so the Christians still represented the biggest single group in effect. But Jovian was in no mood for a fight. The switch back to Christianity was accompanied by a general edict of toleration. The pagans were forbidden from practicing magic, but were otherwise free to worship in their temples according to their conscience. Conscience in religion is of course a minority pastime, most people have always been happy to simply follow the line of least resistance. And no doubt an end to the conflict between the religions would be welcomed by most. The change of policy was quickly noted by the ambitious and the seekers of fortune, who rapidly shaved off their philosopher’s beards and rediscovered the virtues of the gospels. I have a feeling that this particular edict of toleration might have struck more of a chord than previous ones. The sincere Pagans and the devout Christians had both recently had the same experience of discovering just how many of their friends were of the fair weather variety. They probably had a fair bit of sympathy with each other. This was certainly the impression you pick up from an oration of one of the senators of Constantinople called Themistius. This was given to welcome the new emperor and praised his tolerance while knocking the people who could switch sides with little hesitation. Most people can respect another’s beliefs even if they don’t share them. But the sight of people moving from the chapel to the temple and back again according to which way the political wind is blowing is a pretty repelling one. Like all good public speakers Themistius was finding the thing that everyone in the audience could agree on. But while the Christians were for now prepared to indulge the Pagans, they were far from ready to show the same toleration towards one another. Jovian had been quick to display the cross and the labarum, but didn’t immediately identify with any particular faction. This was not just a big thing, it was THE thing. There must have been a time when Christianity was a grass roots movement which spread from person to person by the strength of its arguments. But those days were long gone by the fourth century. It was now a top down religion relying on state patronage, as it has remained ever since. Nobody was going to get anywhere by winning over slaves, women and manual labourers. The only man whose opinion now counted was the man on the throne, and the leaders of the various flavours of Christianity knew it. They all got to Constantinople to make their pitches as quickly as they could. I imagine their representatives eying each other up suspiciously while waiting around in the corridors of the palace for their session with the key man. But eventually the wily Athanasius emerged as the clear favourite of the emperor, and the hopes of the other factions faded. The seventy year old was literally an old hand at this kind of intriguing, but Jovian deserves some credit as well. By spinning the process out, he avoided the other groups forming an alliance against the front runner and diffused what could easily have turned into a crisis. Gibbon does not pick up on this, but there is some indication that the easy tolerance of the early months cooled a bit once Jovian became identified with the Orthodox camp. Athanasius at least could not be accused of trimming his position to keep his position. Over his career he had been exiled five times and had only recently come out of hiding on hearing of the death of Julian. Julian never created any Christian martyrs, but Athanasius was a strong candidate to be the first had he ever got hold of him. Athanasius was an operator of the most skilled variety, and a formidable proponent of his own particular brand of the faith. It seems entirely possible that the adoption of the Nicene creed version of Christianity as the orthodox version is squarely down to the determination and organisational ability of Athanasius. And from the reign of Jovian onwards it would be this orthodoxy that became established and which still represents the standard model of Christianity. And so it looked like the start of a new more peaceful phase for the empire, with peace on the borders and a settlement of sorts of internal religious conflicts. But history rarely runs smoothly. First came the death of Jovian’s father in law. He had settled in well enough in Gaul, but had been killed in a minor rebellion. Then came a real bombshell. Jovian himself was found dead in his tent one morning after a banquet. The exact cause hasn’t been established. It could have been the result of a heavy drinking binge. It might have been some badly cooked mushrooms. But the most likely explanation is that he went to sleep in a room heated by a charcoal burner which as it burnt down led to a build up of carbon monoxide. His wife had within a year become an empress, become the mother of an emperor, lost her father and now lost her husband. Her son was now in a precarious position. He would pose a threat to any future emperor, and the older he got the bigger threat he would pose. At some point he was blinded in one eye. This was a merciful act, given the crazy rules of imperial politics. He could hardly join the army with only one eye. Without military experience he could not progress and so could be left to live. The wisdom of Salust in refusing the throne when offered it in the middle of Persia begins to become apparent. It is all very well getting the glory of being the emperor, but it could as easily ruin your family as make it. But with the post of emperor now surprisingly vacant, Salust was once again everyone’s choice for the top job. And once again, Salust was not interested. He was he claimed, too old. How about Salust’s son? No, he was too young. But Salust did convene the meeting at which the army top brass met to decide on a suitable emperor. The name of Valentinian was the one that elicited the biggest response. He was a good soldier with a reputation for straight talking. He had been an outspoken Christian during Julian’s reign which had led to his removal from the centre of power. But it also gave him a reputation for honesty and meant he was free of any suspicion of plotting. And so he found himself at the age of 43 elevated to the top rank. He still had to go through the ritual of being acclaimed by the troops, and again Salust proved his worth. He choreographed the event carefully. The announcement was timed to coincide with an auspicious astrological moment and all other potential candidates were kept away to avoid them being the focus of an alternative bid. All went very nearly to plan. The troops were impressed by Valentinian and gave him an enthusiastic welcome. The only hitch was that somehow the cry went up for him to appoint a co-emperor. This hadn’t been planned for, but it had to be said that the men had got a good point. In the previous year the empire had twice been thrown into paralysis by the unexpected death of an emperor with no clear successor. Civil war had been averted but it had been more by luck than anything else. Valentinian showed his ability. He confessed the wisdom of naming someone to share the burden but pleaded for time to make a wise decision. This struck the right note, balancing respect for the army with a clear intention not to be dictated to. As it happened he had a brother who was lacking in both ability and ambition. He was therefore the perfect partner for an active emperor, and several weeks later Valens joined his brother to form a partnership. Once again the empire was in the hands of someone well qualified to deal with any military problem that might arise. For now the activities of Julian had cowed the barbarians and sated the Persians. It would not be long before the peace of the empire would once again be disturbed, but for now the new rulers of the Roman world had no immediate problems on the todo list. How Tall Are You? How Tall Should You Be?